Ken Kivenko debates Greg Pollock (CEO of Advocis, an association representing financial advisors) in this BNN video.The intriguing verbal tussle follows on the consultation launched by the Canadian Securities Administrators on the possibility of imposing fiduciary duty as the standard of care for all financial advisors and dealers (see CSA paper here). The video is well worth watching as a gentle introduction to the subject. I think Ken comes off as an effective advocate i.e. wins this debate hands down not only because what he says is true but he expresses it well too. He has also just been named to the Ontario Securities Commission Investor Advisory Panel so maybe can help further such progressive ideas there. The exacting and somewhat cynically inclined lot over on the Financial Webring are also debating the merits and possible practical consequences of fiduciary duty. 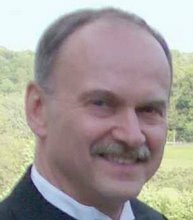 One post by Dan Hallett, who runs what looks to me like a financial advisory firm that has already decided to operate with a fiduciary philosophy, posts a comment that includes this great line: "Either it's [i.e. the financial industry] got to give up the sorts of titles and marketing that imply fiduciary advice or embrace the standard with all of the benefits and obligations that involves." That's the point. It's too complicated. People think they are getting unbiased advice but it rarely is. The financial consequences of biased advice - 20 or more years of a much poorer retirement - are too severe. 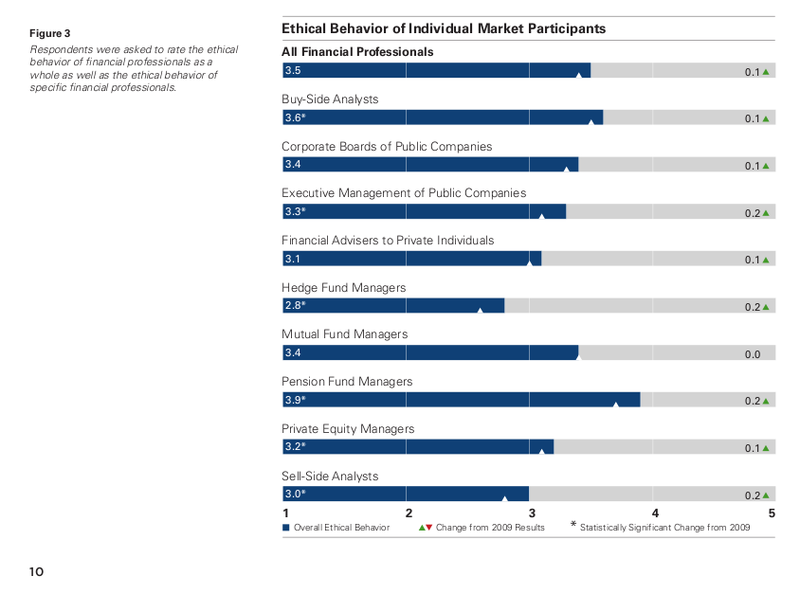 The Chartered Financial Analyst Institute does an annual survey of its charterholders about ethics in various countries. People with the CFA designation almost all work in the business, so this is an insider's view. 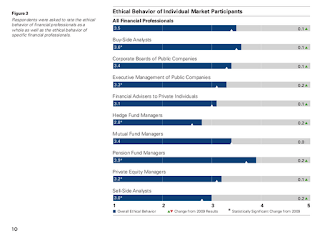 But look anyway below in the latest available 2010 Canadian survey report at where the relative and absolute opinion lies regarding the ethical behaviour rating of financial advisers to private individuals - barely above half way and lower than anyone than hedge fund managers and sell side analysts. There also some damning quotes e.g. "In my career the thing that stands out the most is that most advisers are not out for the client’s best interest; instead they are out for their own interests ahead of the client." 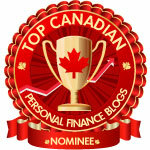 a Portfolio Manager/Investment Consultant in Canada. Sadly, little seems to have changed compared to the situation when I posted about the same survey in 2008. That's a good quote from Hallett. He wants clients to have accurate expectations for the nature of their relationship with their financial advisor. That seems very sensible to me. Looking at that last sentence, it really seems like an argument for an individual to just invest on their own, without any outside advice.